Glazed Wall – The blue tiles in each niche compliment the warm colors in the wall. At night LED lights light up the tiles. 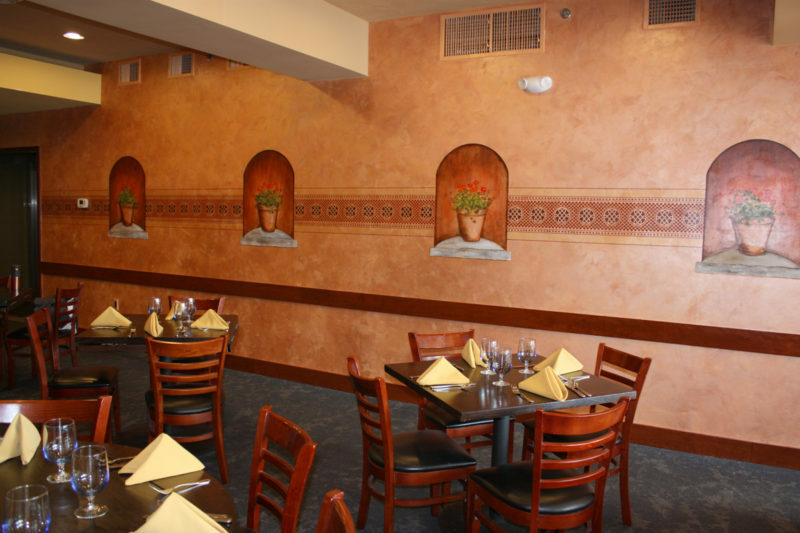 I was recently commissioned to do two wall finishes at Masala Art, an Indian restaurant in Needham. Initially, I was called in to look at one of the walls that had gotten damaged when a sprinkler on the third floor of the building overhead unexpectedly went off. 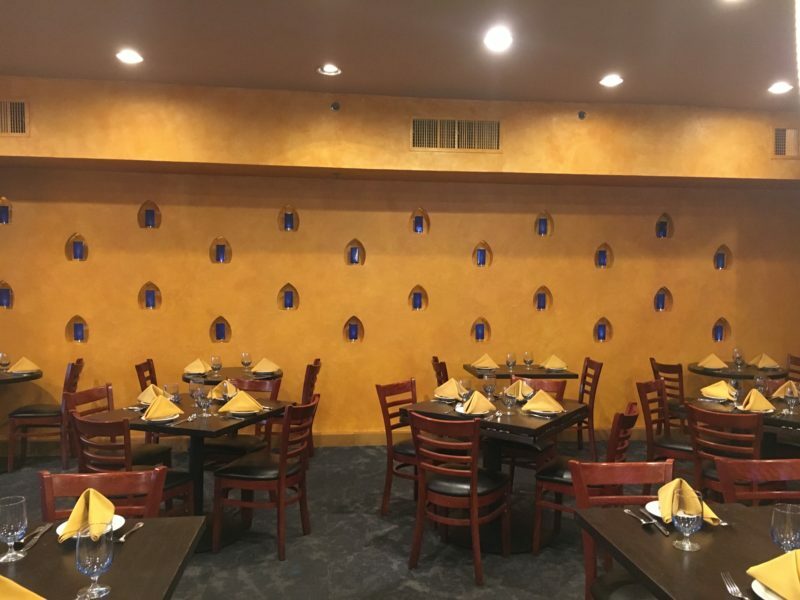 Since that wall needed to be done over, the owners then decided to do a complete overhaul of the entire space. Over the years since they opened in 2003, the decorative finishes on all of the walls had taken a lot of abuse and needed to be updated. 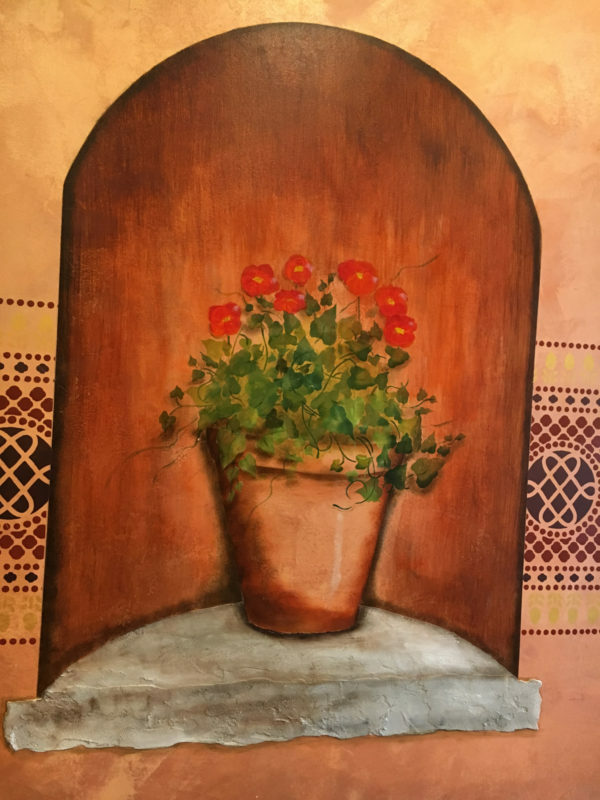 I contacted my colleague and friend, Carol Leonesio, of Paint It!, and we brainstormed to come up with several ideas to present to the owners. They fell in love with the niches and Indian border stencil. 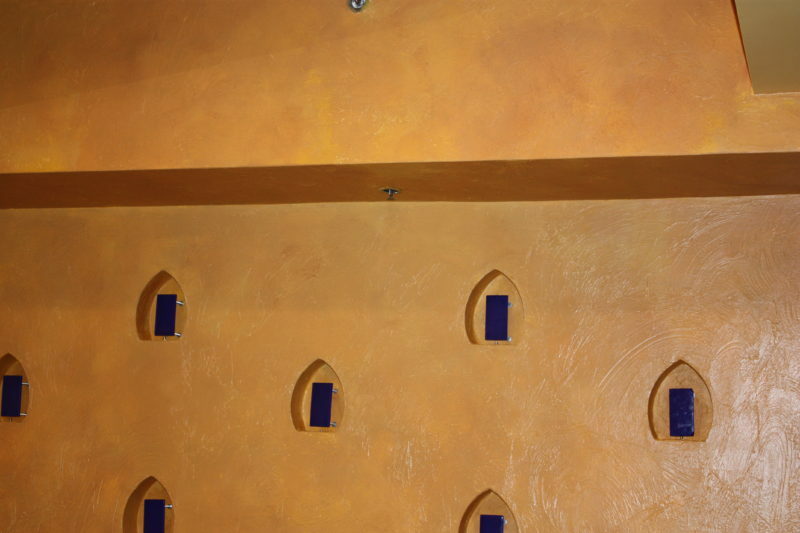 A Lusterstone metallic plaster in two rich, vibrant orange/rust tones was the base for the niche murals and border. Patterns and motifs are an integral part of Indian interior design so it was not surprise that they chose these finishes. Metallic gold, eggplant and a deep vibrant red paints were used in the border. The other wall finish was a two-toned glaze similar to what was originally there. Faced with a strict deadline to have the work done by Valentine’s Day, Carol and I worked long days to complete this project. As with any project, we encountered a few minor setbacks, but as you can see from the photos, it turned out beautifully. The owners are so pleased with the outcome and the response from patrons has been very positive.